Home > Used Vehicles > 2010 Hyundai Santa Fe GL,FWD,AIR,TILT,CRUISE,PW,PL,ALUMINUM WHEELS,LOCAL TRADE!!!! 2010 Hyundai Santa Fe GL,FWD,AIR,TILT,CRUISE,PW,PL,ALUMINUM WHEELS,LOCAL TRADE!!!! Cylinders: 2.4L I4 16V MPFI DOHC - 4 cyl. On sale now! This vehicle was originally listed at $10900. We've marked it down to $9610. You save $1290. This 2010 Hyundai Santa Fe is for sale today in Edmonton. Hyundai designed this Sante Fe to feed your spirit of adventure with a blend of versatility, luxury, safety, and security. It takes a spacious interior and wraps it inside a dynamic shape that turns heads. Under the hood, the engine combines robust power with remarkable fuel efficiency. For one attractive vehicle that does it all, this Hyundai Sante Fe is a smart choice. This SUV has 125399 kms. It's blue granite mica in colour and is completely accident free based on the CARFAX Report. It has an automatic transmission and is powered by a 2.4L I4 16V MPFI DOHC engine. Buy this vehicle now for the lowest bi-weekly payment of $139.84 with $1092 down for 36 months @ 6.99% APR O.A.C. ( taxes included, $790 Administration and Secure Ride included / Total cost of borrowing $1080 ). See dealer for details. 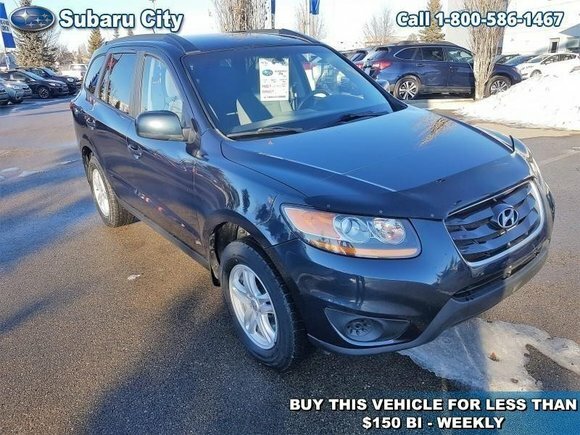 Want to try the 2010 Hyundai Santa Fe GL?